It’s been quite a week as I joined some friends in the Blogosphere — Bill and Franki and Troy and Katie and Tony — around considering how mentor texts can help with digital composition and I have thoroughly enjoyed not only writing my own posts, but reading the rest of the tribe as they shared their experiences. I found it fascinating that as the week progressed, more and more us began to reference the work of the others — so that our work become mentor texts for each other. Could that have happened in a traditional writing environment? Perhaps. But not in a week’s time. If we were writing a book together, instead of creating an RSS-fed site that collected our posts, we might slip our writing into the mail, wait for a response, and then revise and add references to our work, and then — no doubt, weeks or months later — ship our writing off to a publisher, wait for the editors to tear it apart, revise for a few months, and then a year or two later, a book might emerge. And much of the technology would have changed, right? That’s the textbook industry and all of its problems in a nutshell, isn’t it? It also demonstrates how digital tools are changing the way we write and publish. Some of our posts, no doubt, could use more revision and more thought. But in this format of RSS-collected archived, that is less important than our ideas coming together and coalescing around the issue of Mentor Texts in the Digital Writing Workshop. Our ideas bounce off each other. We seek out resonance with each other’s thoughts, and validate or question what we are doing. We improve our own instruction by joining the conversation. It’s all good. I’ve tried to pay attention to some common themes that have emerged among us, too. Although all of our posts are being collected at the RSS site set up by Bill, I wanted to draw your attention to some writing by my colleagues that really stood out with me this week, and will be worth a visit (and a revisit by myself). These are my mentor texts, in a way, that are inspire me to think about the issue of mentor texts in a new way. Franki reminded me about “teaching the writer, not the writing” and how that holds even more true in the digital age. Since so much of technology is new, we can easily get sidetracked into teaching the tool itself. Franki draws a nice connection back to strong writing ideas around the writer/creator as the center of our activities. Troy has been doing great analysis of professional videos as mentor texts. His ability to really dive deep into the concepts and production and construction of video projects is worth checking out. Touching up some complex elements of parody and emulation, Troy makes visible so much that at first seems hidden. His use of the “Dove Evolution” video was quite interesting. Tony’s post about students using design principles to create, revise, and recreate a project was intriguing, and his ability to show us that work in stages was priceless. That’s what we need: more examples of student work in process. And that’s what our students need, too, so that they don’t feel overwhelmed when they encounter a piece of digital composition and think: I could never do that. Pulling back the curtain opens more doors. Katie shares her journey into blogging with her students, revealing the rationale of why moving writing online has power for her young students. I noted in a comment that her post can become a mentor text for other teachers. Her references to authentic publishing and motivation of writers is an argument for other teachers to consider. Bill’s post about how one video idea spurred on another, and then created a sort of resonance loop, was interesting, and it reminded me of how much of that is going on with my students outside of school, particularly around video. More and more of my students have their own YouTube accounts, and when they share what they are doing with me (and I ask them “why did you do that kind of video?”), they often answer with “I saw it on …” I suppose this was always the case — we saw something on TV and tried to replicate it — but now the tools for composition are in the hands of more young people, and they are unafraid to make a ripple in the world. I thank my friends for all of their hard work, and hope our writing has caused some ripples of their own out there in the world. If you have been following this work, thank you. Another element of online digital composition? It remains archived forever. So, come on back when you get a moment and explore. Then, create. Remember this? This was a commercial created by Google for the Superbowl one year, and the video itself went viral, partly because of it storytelling (as an advertisement, of course). Two years ago, as we were discussing the concept of “inference,” we watched the Parisian Love video and talked about what we saw. We talked about what was missing and who the typist might be. I then brought my students up to Google Search Stories — a digital storytelling tool by Google that lets you create a short digital video using only search engine tools. The inferential part of it is that the viewer has to fill in the narrative gaps between the search criteria to understand the bigger story. As is usual, I had created a search story myself, and shared the video and my own reflective analysis, with my students. Then, I set them loose on the site. About a quarter of the class created search videos that looked and sounded and “read” almost identical to mine. I hesitate to call them remixes but it was if my idea for my story had gotten lodged into their brains and could only be shaken free by creating a replica of what they saw the teacher doing. This problem of how we can bring students into something new, share an example of our own making, and hope for original work is one is that not confined by digital tools — but it seems to be made easier with technology. Visually, the digital stories were appealing (it is a Google template after all), and the student work seemed polished, almost professional. This is something a digital tool can bring to the table, right? But underneath the hood, many of them had not gone off in their own directions, as I had hoped. They had closely stuck to what they saw in the Mentor Text and followed that line as closely as possible. I understand the reasons why this is, as they were no doubt thinking “if the teacher shares out a piece work with X, Y, Z elements, my project must have X, Y, Z elements to get a good grade”) but I wish it weren’t so. I always try to remain open for students taking a piece of work in a new direction, and actively encourage it. Sometimes, Mentor Texts hem them in. And sometimes, given the affordances of a tool of technology (like the Search Stories, with its limit on search queries and its format), a user can still feel stuck and confined. I didn’t regret the use of my own Mentor Text for this kind of video project, but I did wish I had found more ways to encourage students to push beyond what they see, instead of just creating a bunch of “Mini-Me” replicas. So, the next year, when we did Search Stories, I took a different tact. I had them create a digital search story based on a short story they were already writing — this gave them some of their own content to pull from to use as the narrative frame of their video, and allowed the Mentor Text to become a way to talk about format and technique, but not content, since my own story that I was writing with them was different from their own. The result was a much wider array of interesting videos. I have been honored to be taking part this week in a blogging series around mentor texts and digital composition. 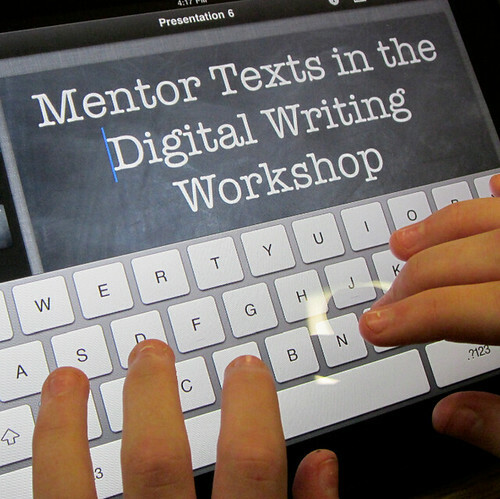 The blog posts are all being collected over at Mentor Texts in the Digital Writing Workshop. For a post I am writing tomorrow, I am exploring some issues that include my students using Google Search Stories. I thought I might have some fun and create a Search Story that features the six of us bloggers. One of the most difficult parts of using technology and digital media with students remains with how best to assess a piece of student work. Given that there are not enough mentor texts with which we can use to showcase exemplar projects (see my post about teachers needing to be creators), we need to engage students more in the development of assessment tools. I’ll be honest: this guided collaborative thinking between teacher and students takes time and I owe a lot of work I do around to a fellow Western Massachusetts Writing Project friend, Mary Farrin, whose workshop on rubric development opened my eyes. The way this works is that the teacher presents a piece of work — in this case, a digital text — and together, the students and the teacher identify areas that should be part of a final assessment. The broad topics then get broken down into categories. The role of the teacher is to guide the discussion and focus the students on elements of importance. As Mary used to say, it is the process of developing the tool that gets students focused on meeting our expectations for their best work. After the brainstorming by students, the teacher then takes those ideas and develops a scoring tool that makes sense for a project. The students feel as if their voices are part of the mix. Last year, I used this process for a Digital Poster Project that was a companion piece to an environmental essay project. We were using Glogster, which is a great site with many tools and possibilities but it is also is a site that has so many tools that some students get caught up in the flash and forget the content. So, we worked together on developing a rubric. First,we examined a few Glog projects from the classes from the year before. We were just “looking” at elements that seemed worth “noticing” and discussing why something like design might play a role in the way a teacher might assess a digital poster. Next, I created my own Glog about the topic that I was writing about (just ahead of them) around Fuel Cell Technology. A few years ago, I was part of an initial gathering to talk about and begin planning content for the National Writing Project‘s Digital Is website. The conversation often turned on the name of the site. In fact, I often had trouble getting my head around it. NWP Co-Director Elyse Eidman-Aadahl, however, patiently and continually explained that the concept of the resource site would be to acknowledge that we are now “in the moment” of a world infused with digital technology, and the time had come to determine where such a movement would be taking learning. “Digital just is,” she would say, acknowledging that technology had already become a fabric of our world. I think I get it now. And I know that Digital Is is one of those sites that continues to explore the various angles of intersection between the “why we use technology” (as opposed to the how to do it) and “why it matters for learning.” One of the valuable elements of a site such as Digital Is is that it provides a framework for discussion, and provides some mentor texts for teachers to consider, which is crucial. A few years later, we may still be “in the moment” and that means that, with some exceptions, there is still a decided lack of digital examples of composition with technology that we can turn to as educators and provide as samples for our students. For me, this conundrum often means that I am creating my own mentor texts just ahead of my students, and then sharing those reflections of my process with my class as a way to make visible the success and failures of my work. I’ve been making stopmotion movies, webcomic collections, digital picture books, digital stories, hyperlinked poetry, and even science-based video games over the years. Teachers don’t need to be complete experts — heck, no one is quite the expert yet when it comes to composition with technology, which is the whole point of us being “in the moment” — but we do need to be intrepid explorers alongside our students. For some educators, this is scary business. You need to expose yourself as less than an expert. You need to be ready for failure on your exploration, and make quick turns in expectations. You may need to cede direction to your students, who may have more experience in an area than you (for me, this was with video game design). You need to see the “end goal” in mind (backwards design) and tiptoe forward along the path towards those goals. You need to document your journey, and reflect afterwards, and collect data and examples. In general, I have found that students respond well to the understanding that their teacher is trying something new and they appreciate the honesty of a teacher exploring new terrain. What we need to be doing is constructing our own mentor text collections, even as we keep an eye out for what others are doing. This means, too, that we teachers need to be sharing our worlds of exploration with our colleagues, and with the world. Don’t keep your work hidden inside of your classroom. Use the tools of the modern publishing age to share out your expertise, and together, we can begin building a database of mentor texts in the digital age. And push the limits of what technology can do. I realized this early on, when I began to teach my class how to create stopmotion movies, starting from the storyboarding, right through scriptwriting, and into production. At the time, there was very little out there. The Wallace & Gromit movies were not yet as popular as they are today and yet, I was determined to help my students become filmmakers. But I needed something to show them, something that they could build upon in their own way. So, I started at home, working with my own young boys on our own little movie, which turned into a three-part series (they loved it that much). This short film is what I later shared with my students, talking through the process that we went through: what kind of props; what kind of story; what problems we ran into; how did we collaborate; etc. The result was a piece of work that we could dissect together, and then, when my student were working on their own movies, they could use that experience. And I, as the teacher, had first-hand experiences with stopmotion movies. The experts are us, and our students. We need tor recognize this fact more often, and exploit the journey as much as the task, as we seek to build knowledge and experience to push learning and creativity in new directions. In early January, I am going to be joining some blogging compadres with a series of posts that will center around using mentor texts for digital composition. The idea is to consider how we are using mentor texts for students as they make a shift toward writing with digital tools, and what that might look like. I am still mulling over what I want to write about, but Bill Bass is starting to pull together a site that will aggregate our posts together, so consider this the first shot across the bow!